A new set of leaks from Weibo suggests that the upcoming OPPO R19 will have not 1 but 2 selfie cameras embedded directly into the display. This putative new step in smartphone design would result in a near-100% screen-to-body ratio. The new leak also alleges that the R19 will have 6GB of RAM. 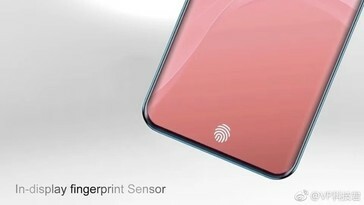 A report from about a month ago referenced leaks that indicated that an upcoming OPPO phone would have a groundbreaking in-display front-facing camera. This kind of technology could obviate a notch of any kind, and push a device's screen-to-body ratio closer to 100% than ever before. A more recent rumor emanating from Weibo suggests that the same putative OPPO phone - the R19 - could actually have a dual in-camera selfie shooter. The render also includes English-language text reading "40MP dual front camera". It also shows a '5G' symbol in the "R19"'s status bar, thus hinting that the phone has the next-generation of mobile connectivity as well as that of display-panel technology. The R19 is also rumored to come with 6GB of RAM and up to 128GB of internal storage. Further images of this new render also point overtly to an in-display fingerprint sensor for the phone, and also show a triple rear camera module. 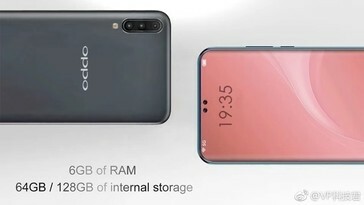 It is anticipated that the OPPO R19 will be released in 2019. There is no more concrete information on it, such as its price or availability, at this point.